Gasification and Pyrolysis are ways of producing calorific gases from carbonaceous materials by heating the feedstock materials in a controlled manner to prevent them from fully combusting. 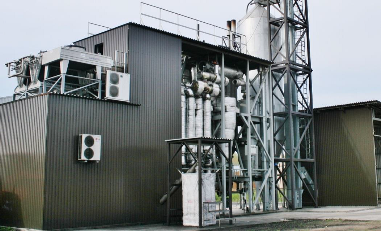 Gasification is a starved air process where the feedstock materials cannot fully combust as there is insufficient oxygen in the gasification chamber. A small amount of combustion does take place in the chamber and that is used to provide the heat required to drive the process. The uncombusted gases produced can then either be burnt directly in air to produce heat and raise steam for industrial processes and district heating schemes or to drive a steam turbine. These types of gasification schemes are generally called close coupled gasifiers. Pyrolysis is the decomposition of carbonaceous feedstocks in the virtual absence of oxygen. The material is indirectly heated in a large retort, fitted with airlocks, until it breaks down to form a mixture of calorific gases including hydrogen, carbon monoxide, methane and other hydrocarbon gases. Due to the absence of nitrogen, the produced gases are more calorific than from gasification and are therefore easier to burn in gas engines and turbines. In advanced gasification and pyrolysis, the produced gases are either combusted in a second chamber or cleaned and used as a fuel gas to power gas engines or gas turbines which can then be used to run a generator to produce electricity for sale to the grid. 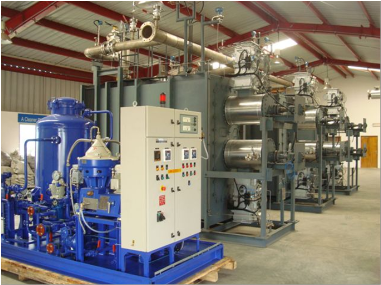 In most Waste to Energy applications the produced gases are used to generate both electricity and process heat in a system known as Combined Heat and Power (CHP). However, if the waste heat from the gasification and power generation stages is high grade heat at circa 400°C (gas engine or gas turbine exhaust) a heat recovery steam generator (HRSG) can be used to raise steam to drive a secondary turbine to generate more electrical power. These more advanced systems are termed Integrated Gasification Combined Cycle (IGCC). Both the CHP and IGCC configurations ensure the most efficient utilisation of the feedstock energy content and are to be preferred. In the UK the Renewables Obligation subsidises every megawatt hour (MWh) of energy generated by gasification and pyrolysis systems by awarding 2 ROCs per MWh which at current rates makes each MWh worth circa 2.5 times the unsubsidised value. This makes advanced gasification and pyrolysis a very attractive solution for any waste to energy project. However, this technology is considered by many to still be an emerging technology which can make funding a project more difficult but not impossible. The secret is to match the technology to the feedstock and to ensure that the feedstock is consistent, homogenous and relatively dry, all of the time! SES works closely with some of the leading gasification/pyrolysis technology providers and has conducted independent due diligence on many others. The systems that we recommend come with insurance backed performance guarantees to ensure no loss of revenue due to unexpected plant outages.